I herewith certify and acknowledge that I understand that my acceptance on a diving tour organised and conducted by Sunrise Divers Co., Ltd., Phuket, Thailand is predicated on my assurance that I am physically fit to engage in ocean scuba diving. That I have had or will receive sufficient training in scuba diving and that I fully understand the risk of ocean diving, of living and travelling on board a ship and the dangers arising from force of nature. I am prepared to assume such risk. In order to induce Sunrise Divers Co., Ltd. to accept me as a member of the aforementioned diving tour. I hereby release and absolve Sunrise Divers Co., Ltd., its agents, employees and invitees from any and all damages resulting from death or personal injuries, including loss of services, which I may sustain on account of, arising from, or in connection with the aforementioned diving tour or the ownership, maintenance, use or operation of any automobile, ship, boat, watersport equipment or otherwise. I further understand that remoteness of destination, local custom and/or prevailing weather conditions may cause minor inconvenience or modification to the diving portions of the tour, and Sunrise Divers Co., Ltd. reserves the right to modify and/or cancel diving arrangements due to unfavourable weather conditions and/or technical difficulties. National park fees, harbour fees and fuel surcharge are payable on the boat. If conditions change due to one or more of the following reasons: bad weather, perils of the sea, acts of God or political incidents resulting in making it unadvisable or dangerous to the health or life of passengers or the safety of the boat – your cruise departure may be delayed or cancelled. If the cruise is already under way aforementioned reasons may result in a change of destinations, ports or visits to Islands. This change of destinations is not considered satisfactory justification for a refund. We would like to strongly recommend that you have covering cancellation insurance. If we cancel the cruise you are entitled to a 100% refund of monies paid, less any bank charges. Shortened trips entitle you only to a proportionate refund. I also agree to pay compensation at full current market value to Sunrise Divers Co., Ltd. for any and all damage or loss to property and equipment belonging to Sunrise Divers Co., Ltd. resulting from above or negligence on my part. I further agree to strictly observe and comply with additional reasonable terms and regulations Sunrise Divers Co., Ltd. or any of its employees may deem desirable or needful to prescribe during the course of any diving tour. Customers must secure appropriate travel insurance, with a reputable insurance provider, and applicable to the activities they will be undertaking. Such insurance should provide comprehensive coverage of at least the following; Scuba Diving, Medical, Travel, Personal Liability and Cancellation provisions. The operator shall not be held responsible for any resultant financial or personal loss or injury where customers choose not to secure such insurance. To confirm your reservation, we require a minimum 30% deposit of the total price. If you are booking less than 60 days before the commencement of your package, full payment is required on booking unless otherwise noted in communication with us. On receipt of a 30% deposit, or full payment where applicable, we will send you the final booking confirmation. The remaining balance of 70% must be paid to us not less than 60 days before your package commencement date. If you decide to cancel your reservation 60 days or more before your package commencement date, or 90 days before your package commencement date for full boat charters, we will return your payment less the deposit and any bank charges incurred by us. If you cancel your reservation less than 60 days before your package commencement date for single or group bookings or 90 days before your package commencement date for full boat charters we reserve the right to compensate for lost bookings by retaining all payments. Please inform us of any changes to your booking at the soonest opportunity. NOTE : For bookings made with special early booking offers, or last minute bookings, no refunds can be made. Cancellation can only be made by email or in writing. You may inform us of a cancellation by phone but this must be followed up with an email. NOTE : For single day trip cancellations, you can cancel up to 48 hours before the departure for a full refund minus bank fees. Any less than 48 hours, no refund. No show for any reason, no refund. If a trip is cancelled by Sunrise Divers or the boat operator we will offer you the choice of an alternative trip on another boat or another date, a credit note or a full refund of the trip price less bank fees. We are not responsible for losses due to changes in hotel bookings or flights etc. We strongly recommend all guests have cancellation insurance. Thank you for booking with Sunrise Divers. If you have any questions, please contact us. We wish you happy diving! The making of a booking with Sunrise Divers constitutes your acceptance of all booking terms and conditions. Why should I book with Sunrise Divers? Sunrise Divers is not just a website. We are right here to help you with a PADI 5 Star shop, helpful and experienced staff, quality rental equipment and plenty of local knowledge. We hope to meet you in person! 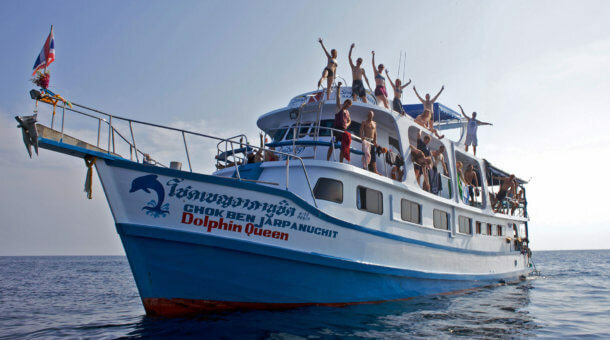 Sunrise Divers has been operating in Phuket, Thailand since 1999 logging thousands of dives all over the region. We know the area, we know the dive sites, we know the boats. Let us help you find the right trip! We advertise all trips at the official rates agreed with the boat operators. 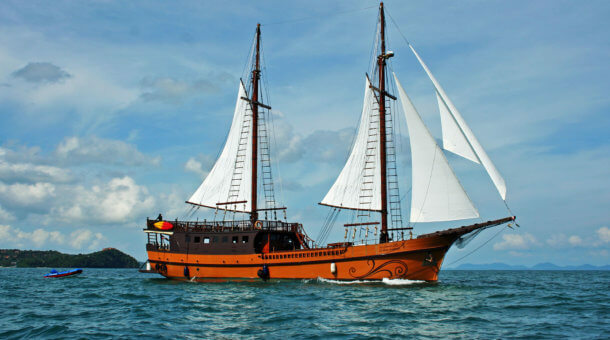 If you are offered the same trip on the same liveaboard at a lower price, tell us! We promise to get you the best trip at the best possible price! With our many years of experience, booking with Sunrise Divers is quick and easy. Got a question? We'll answer! Need to talk? Call us! Online credit card payment with no fees is possible for most trips. We know the boats and the area better than anyone. See you here! 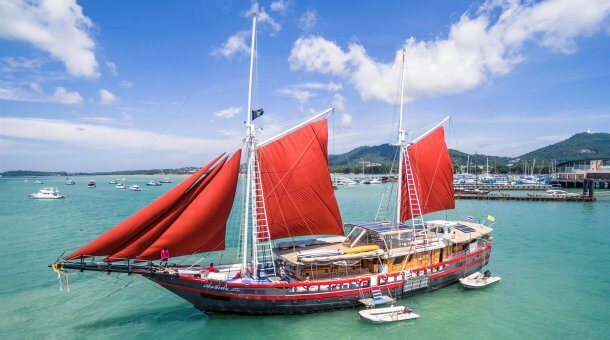 We highly recommend the following liveaboards! CALL +66 84 626 4646 OR EMAIL US ANY TIME! We're your helpful, friendly Phuket dive centre for all your Thailand diving needs. Our dive shop and office is located a few minutes walk from the sands of Karon beach. Browse our website to find information about the best scuba diving in Thailand. 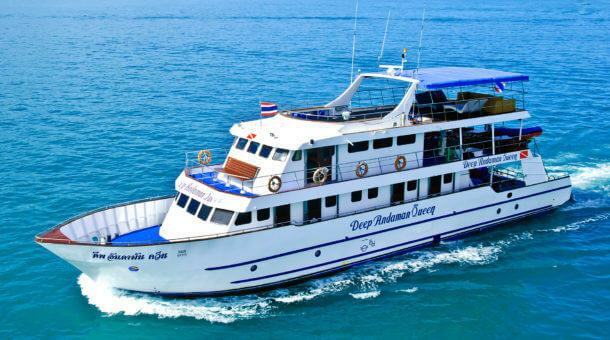 Liveaboards to the Similan Islands and Myanmar, day trips to many beautiful and exciting dive sites around Phuket and Phi Phi Islands, PADI courses for beginner divers or advanced divers and much more, we are always here to help you with enquiries! Copyright 1999 - 2019 © Sunrise Divers Phuket, All Rights Reserved.